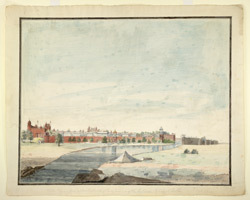 Watercolour of the Red Fort in Delhi, seen from the opposite bank of the river Jumna with a tent in the foreground, circa 1815. The Red Fort or Lal Qila, was constructed by Shah Jahan (r.1627-58) for his new city of Shahjahanabad. The Lahore gate was one of the main entrances to the fort and is composed of a high central arch with side towers. The octogonal-shaped fort complex is surrounded by high fortification walls of red sandstone which reach between 18-33 m in height. Key buildings inside the fort include the Diwan-i-Am (Hall of Public Audience), the Diwan-i-Khas (Hall of Private Audience), Moti Masjid, and the Khas Mahal (private chambers of the emperor).